This has not been a fun Sunday evening. At about 4pm or so, my network went down for about 15 minutes. At first I thought it was just me, but as it turned out nearly all of my wifi neighbors dropped off of the face of the earth too - with only two left standing. The two left standing are not using Comcast. What happened was that I got a new IP address that actually makes sense considering the geographic number system that Comcast seems to use in this area. Unfortunately, it seems that my Netgear router kicked it when the network came back up, so no wifi through Netgear for me. I do have an Airport Express (thanks a certain Apple store in NYC) and I’ve been trying to configure that to be my network router. There’s some setting I’m missing since I’ve been playing around with it for the past 45 minutes and it seems not to be able to connect to Comcast at all. I can see the Airport Express and configure it. It just can’t communicate with the cable modem - and yes there is an Ethernet cable connected between the two. If I sit next to the cable modem connected through an Ethernet cable, obviously I can connect to the Internet as I can write this. Hrm. Update: I’m up. But only after a whole heck of a lot of rebooting and reconfiguring and cursing. Basically, it seems that I needed to powercycle the cable modem (several times repeatedly) with the AirPort Express already on and configured. I lost the link I was looking at, but the theory is that the cable modem would grab the new-to-the-cable-modem MAC address of the Airport Express. Protopage happens to be yet another Web based configurable start page, very similar to Netvibes. It appears that protopage is a bit more graphics friendly than other start pages. If you’d like, you can always add cleverhack to your protopage. -First find of the week is Seth Godin’s Web 2.0 Traffic Watch List which predictably enough, tracks traffic trends of Web 2.0 sites. Upon reviewing the list, some of the sites I’ve heard of and even use, but there’s plenty more that I had no idea existed. I’m sure this list will keep me busy for a while. -Second, is Crowdstorm, which bills itself as a social shopping site - much like Amazon’s user recommendations and ratings. It’s in beta and I received an invite to join. The two hurdles that Crowdstorm needs to overcome is that a)obviously, it needs more users to be effective and b)it seems to be UK oriented at the moment (note the kelkoo reference) so I am not sure if it’s intended for a US audience. The Crowdstorm admins may want to tag their site with “The best UK social shopping” or whatever they prefer. One other item of note, I like the crowdstorm site design - they could actually go a little wider on the body of site. Perhaps make the thumbnails a little larger and the text bigger - although I’m wondering if they are trying to allow for mobile device viewing. And for the cool factor, their markup is XHTML Strict - even using PNGs for the images. Liferea is a news feed reader for Linux systems using GNOME. I’m conflicted here, is the punchline that AOL is so much in trouble that are hoping to find buried treasure or is it that they are digging for buried treasure at a house that belongs to the parents of a spammer ? According to the NY Times, Dell is recalling 4.1 million lithium-ion batteries made by Sony and installed in laptops sold between April 2004 and July 18th 2006. If you own a Dell (I can think of a whole heck of a lot of people off of the top of my head who could be affected, including my own Mother and certain bloggers), then go to www.dellbatteryprogram.com to check if your laptop battery is included in this recall. Heh. I just checked (at 6:53PM Eastern time on 8/14/2006) and there is nothing about the recall on the Direct 2 Dell blog. Update1: Oh My. This keeps on getting better. The dellbatteryprogram.com site is currently unreachable (7:04pm Eastern on 8/14/2006) and the Google cache dated 8/09/2006 for dellbatteryprogram.com contains an earlier Dell Battery recall program. So, either the NYTimes got the url wrong or Dell is not ready with their Web site yet. Update2: A visitor from Dell corporate clicked through to this entry from Technorati and surprisingly enough, Dell has responded on their blog. And they even mentioned that the recall Web site will be live after midnight Central Time tonight. 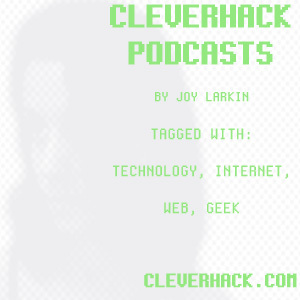 The ninth cleverhack podcast is now posted for your enjoyment. This podcast covers spam and discusses a recent Wall Street Journal article about empty spam and the concept of greylisting with your MTA. Enjoy. Another Web 2.0 site built on the theory of “tagging”, tagjag is a blogosphere (and more) metasearch powered by gada.be. From what I could gather, their big thing is that their search results are outputted in OPML. The reason why I noticed tagjag this morning is because their results page is requesting a favicon.ico file from a source in their results page. In other words, a page of mine appeared in tagjag results. I dunno. Why can’t tagjag just cache the favicon file rather than request it every single time? First, it does use my bandwidth (yeah, I know I could fix that via .htaccess) but secondly, I now know who exactly is using tagjag and finding any results that pertain to my blog. Hrm. UPDATE1: I’ve gotten a few questions about why the favicon.ico request matters. Well, the thing is that yes, other services do pull my favicon.ico file, like for example Google Desktop or My Yahoo. However, those users opted in (for lack of a better term) to use my site, either by subcribing to my feed or by clicking through to a link of mine. tagjag/gada.be is different in that the users are merely using the service and yet a third party will know what they are searching for, if that third party appears in the results pages. No opt in or clickthrough or subscription to the third party’s site required. OT: I have to hand it to the enthusiasm of the bluedot folks, ever since I first wrote about them I’ve been getting hits on searches for bluedot from Seattle based users. You are currently browsing the cleverhack dot com weblog archives for August, 2006.